Actually the question I get MOST is “where do you get your ideas,” but there’s another question I get asked more than any other. Because the one thing I’m short on is ideas, which is why people keep asking me where I get them. My books are available for sale on Amazon and you can order them through local bookstores AND you can purchase them directly on my very own website, and readers often want to know which place will help ME the most. Traditionally published authors will sometimes discourage people from buying ebooks, because their publishers don’t like ebooks. That’s because publishers have huge investments in print books so that if they don’t sell enough print books, they lose money, EVEN IF they’re selling as many or more ebooks than the print books they’re not selling. It’s … it’s madness. It’s Sparta. But some people just LIKE reading ebooks better than print books. I’m not that way, but I totally get it. And if that’s the case, I want you to buy my books on Kindle so that they are as fun for you to read as possible. I mean, it’s not long-term smart for me to ask you to read a physical book if that’s going to be annoying for you, because then you probably won’t read the next one. And then when it comes to print books, if you want free two-day shipping with Amazon Prime, get the print book on Amazon. I like free two-day shipping with Amazon Prime, too! I use it all the time! I do not at all blame you for wanting your book delivered quickly and conveniently and cheaply. Also, if you’re an international reader, Amazon’s pretty much your only option. I mean, I CAN ship you a book overseas, but the shipping will cost three times as much as the book will. However, if you really do JUST want to read my book, and you’re not worried about expense, or fast shipping, the absolute best place to buy is on my website, which is the first link in the doobly-doo below. See, when I sell a print book on Amazon, Amazon takes a whopping 55% of the sale. That might sound wildly unfair to you, and maybe it is, but it’s also how the book industry works. You buy a book at Walmart? Walmart gets 55%. Barnes & Noble? 55%. —which is one reason traditional authors love for you to buy their books at indie bookstores. Although hey, I also want you to buy my books at indie bookstores. I make the same amount of money, but I just like indie bookstores a lot and want them to exist. But anyways, if you buy my books on my website directly from me, I get to keep that extra 55%. Well, not all of it. There’s shipping and packaging and stuff. But it’s still a LOT better for me. The best possible place for you to buy my books is directly on my website. Link right up there and in the doobly-doo. And speaking of which, I haven’t made a video since we released The Nightblade Epic Volume Two, which is this gorgeous little book I’ve got right here. Not gorgeous little. Gorgeous huge. Really, really big. Can’t lie, this is my absolute favorite Underrealm cover. Favorite. It’s amazing. Look at it. What can I even say? Inside you’ll find books four through six of the Nightblade Epic. You’ll also find sixty pages of bonus materials called the Addenda, that you can’t find anywhere else. And there’s a MAP! A big, gorgeous, absolutely wonderful MAP! I can’t tell you how happy I am about this! 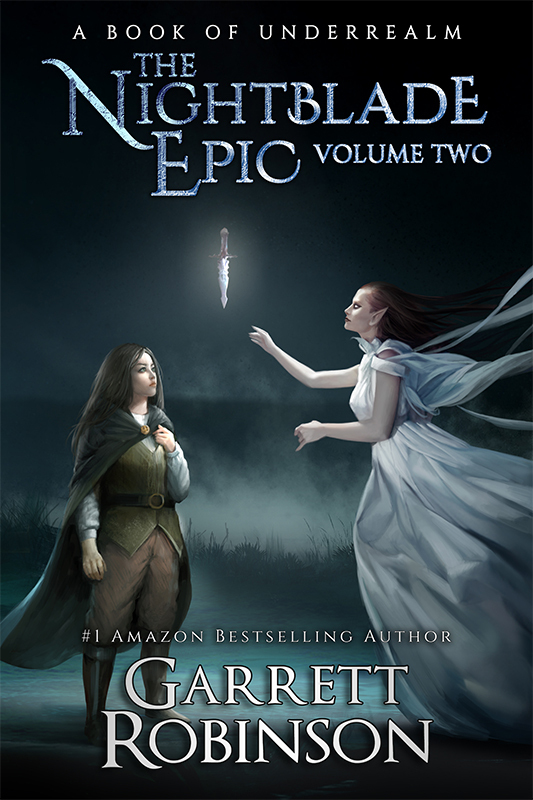 So if you want to pick up The Nightblade Epic Volume Two, grab it directly from me on my website—or, honestly, whatever is easiest for you. That’s all I’ve got for you today, Rebel. If you’ve already got the book but want to show your support another way, click the Merch link below and pick up one of these sweet Mystic shirts. They’re gorgeous and half the profit goes to the artist who designed them, and he’s amazing. For more cool stuff to do, check out my last video on the channel right up there or check out my Patreon right down there. Thanks so much for watching, and I will see you next week. Byyye!